American Motors had a habit of making even shorter versions of its not-so-long-to-begin-with cars back in the late ’60s and early ‘70s. 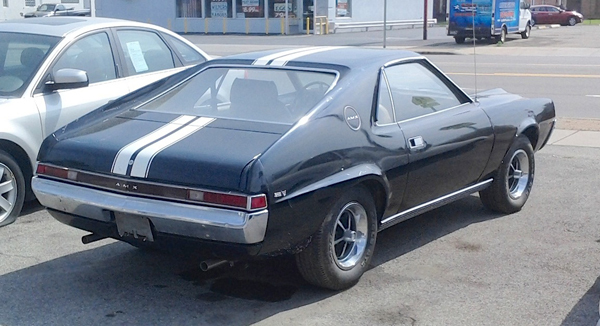 The Gremlin was a Hornet with the back end chopped off, while this 1969 AMC AMX, seen recently in Tonawanda, was basically a Javelin with the rear seat section surgically removed. The results are mixed. While personally I like the Gremlin, it was a polarizing design; the AMX however, looks much more like a car that was built from scratch. Its two-seat configuration limited its sales, but it brought AMC some much-needed cred at a time when they were in dire straights financially. Jim Corbran, RRofWNY Check out our new Facebook page: LuvTheCheapies The post RealRides of WNY appeared first on Buffalo Cars.